Time seems to fly by more quickly the older you get. That’s because a mere day represents a larger percentage of the time you have left than it did when you were young. 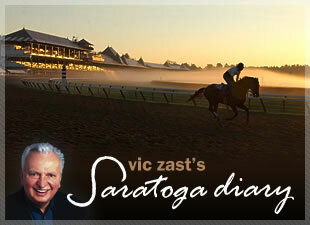 The 2012 Saratoga meet has advanced to a point that is roughly 70% of its 40 afternoons. There are many things to do in the little time remaining. If you haven’t been to the Mouzon House for a New Orleans dinner, get yourself there in a hurry. If you haven’t sipped cocktails on the front porch of Maestro’s, it’s not too late. The museums and theaters in Glens Falls and Cooperstown, N.Y., Williamstown, Mass., and Dorset, Vt.─quaint towns that are a short drive away─deserve that you hit the road on the last remaining Tuesday, the dark day. With a little more wear and tear on the tires, you can make it to Hyde Park, N.Y. Visit the home of Franklin D. Roosevelt. You won’t regret it. 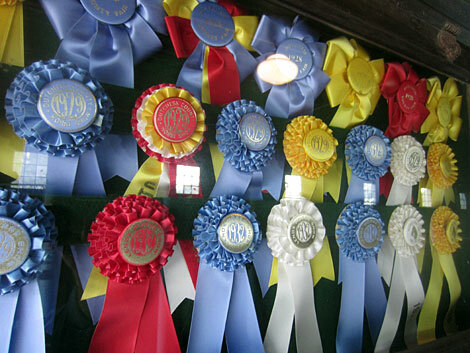 Prize ribbons on the wall of the horse barn at FDR's estate in Hyde Park, N.Y. The Union Avenue Stakes was the fifth and feature race on Monday. But it was the second race that caused the most excitement. A jockey was taken to hospital. A horse was euthanized. The casualty was the third of the season, the sixth if you count the three steeplechase horses that succumbed as a result of an accident on Preview Day. Junior Alvarado, the rider who was injured, will be OK to ride on Wednesday. Kent Desormeaux continues to do well when given the chance. Trainer John Hertler provided him the ride in the fourth aboard Half Wildcat and the Hall of Fame jockey steered the 5-1 hope to the finish line first. Desormeaux had four other rides on the card, an improvement on the number he’s been handed before. His weight, not his attitude, is the issue. Mike Repole’s cleverly-named Notacatbutallama had a little trouble loading into the gate for the seventh. But once that was behind the New York-bred colt by Harlan’s Holiday, he ran off to a 6 1/2-length victory as the even money favorite. Notacatbutallama was another in what seems to be an endless pageant of 2-year-olds winning for trainer Todd Pletcher. Curragh Stable’s Irish Jade, trained by John Terranova, finished second like a horse to bet on next time. In contrast to the expectancy of Pletcher’s achievements, trainer Juan Coronel notched his first-ever victory at Saratoga in the Union Avenue. “I have been waiting for this moment for so long,” Coronel told the press. His New York-bred filly Risky Rachel overcame a clumsy start, raced wide leaving the backstretch, but slipped by Final Mesa down the homestretch.